Jade Eagle is a small business located on Eastern Long Island dedicated to providing unique art and home decor items from around the world. Our assortment of products range from affordable gift items to one-of-a-kind pieces of art. All items have been personally selected with care by our owner from towns and markets in the Far East and Africa. We strive to offer products that can tastefully fit in any American home, while still reflecting the traditions and ingenuity of the cultures that produce them. Many of our products are hand-made with natural materials such as wood, straw, bamboo, raw silk and shell. 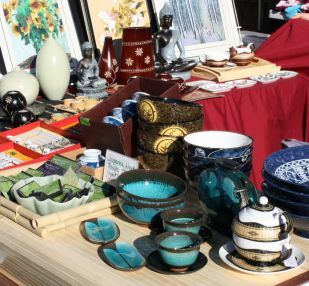 Among our range of products you will find things like Chinese embroideries, Japanese sake sets, Laotian scarves, Korean lacquerware and Kenyan wood carvings. We operate a "mobile store" and you can find us at festivals, cultural events, craft shows and fundraisers throughout the New York Tristate area. Find out when we will be attending an event near you by checking the regularly updated event list or by joining our mailing list to receive notices on updates and promotions. Aside from purchasing at our mobile vendor booth, you can also arrange for pick-ups from our warehouse in centrally-located Bohemia, Long Island. Our customers also have the ability to purchase and pre-order products online or over the phone. For more information on payment and delivery options, please refer to our Ordering & Shipping webpage.